We managed to stay off-track again in our third year of maintaining this travel blog 🙂 Read on and be inspired by five out-of-the-box trips and activities in the Netherlands. 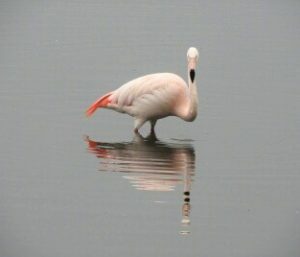 Amidst the beauty of the marshlands dotting the eastern border of the Netherlands lies the Zwillbrocker fen; home to Europe’s most northern colony of flamingos and thousands of black-headed gulls. 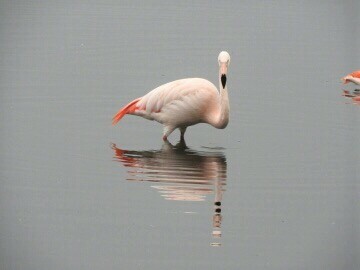 This captivating sight just across the border in Germany is the highlight of the Flamingo Route. We embarked on a three day cycling trip in late March. Camping season hadn’t started yet but we found two campsite owners willing to host us over the weekend. Blessed with sunny weather, we cycled through wetland reserves grazed by Galloway cattle and the picturesque landscape between Enschede and Winterswijk. A perfect weekend outdoors in early Spring. 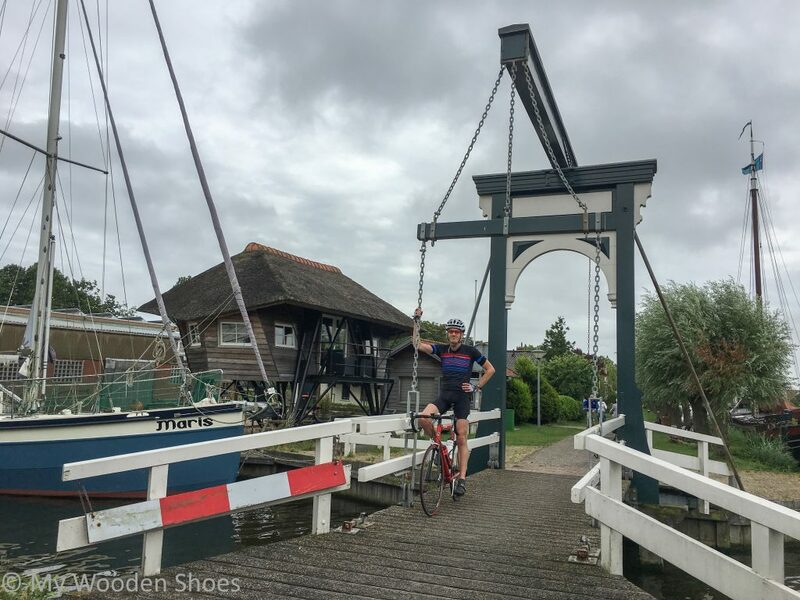 Forget Zaanse Schans and experience wind mills, cycling and strong winds on a 126 kilometer tour following the ‘Westfrisian Omringdyke’, a centuries-old circular sea dyke and manmade miracle according to the humble opinion of the locals. This trail is particularly suited for racing bikes and as such can be accomplished in one day. Not surprisingly, the dyke is the stage for an annual cycling race and claimed to be “a wonder beneath the wheels”. Don’t miss out on the 2018 edition or find your ideal cadence while enjoying the views on any other day of the year. Trekking with a donkey must have been the oddest and most memorable thing we have done this year! And highly recommended 🙂 We undertook a two-day trek with a camp overnight. 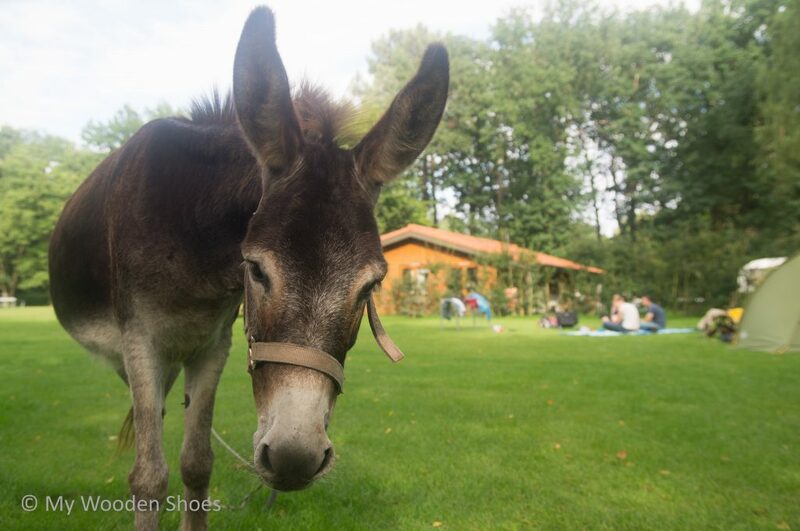 Our donkey Rieky quickly became our best friend. She added a special touch to the trip with her attitude alternating between indifference and stubbornness. 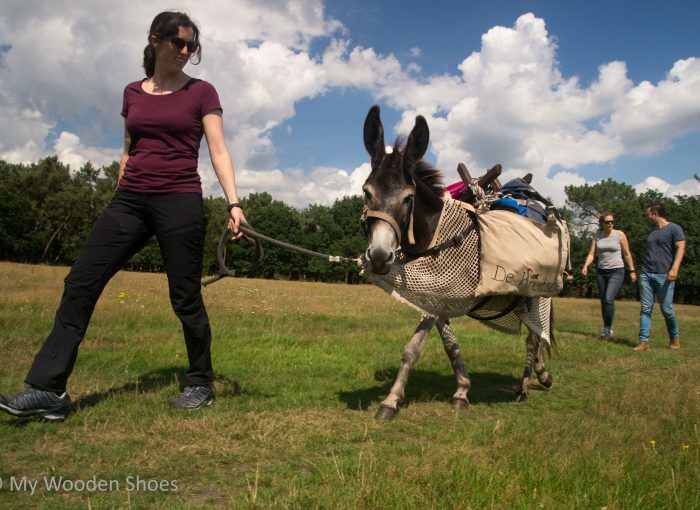 While she carried our light daypacks, we navigated across the countryside of Brabant. Our luggage was brought to the campsite by the donkey’s owner of farm De Kreitsberg, and when we reached the place at the end of the day, the donkey turned out to be a big attraction for kids and adults alike, even though she kept the whole lot awake with her hee-haw throughout the night 😀 This trip was pure joy to everyone! Berg en Dal (Mountain and Valley) is the starting point of a promising 16 km long hike with more vertical than horizontal meters to conquer, so to speak. The Nature trail-70 (N-70) is particularly appealing in autumn with its ascends and descends along an ancient, forested ridge in the landscape. With eight ‘mountains’ – one aptly called the Devil’s Mountain – the trail provides an excellent run as well. Don’t forget to stop over for lunch at the Devil’s Mountain pancake restaurant which serves excellent pancakes. P.S. 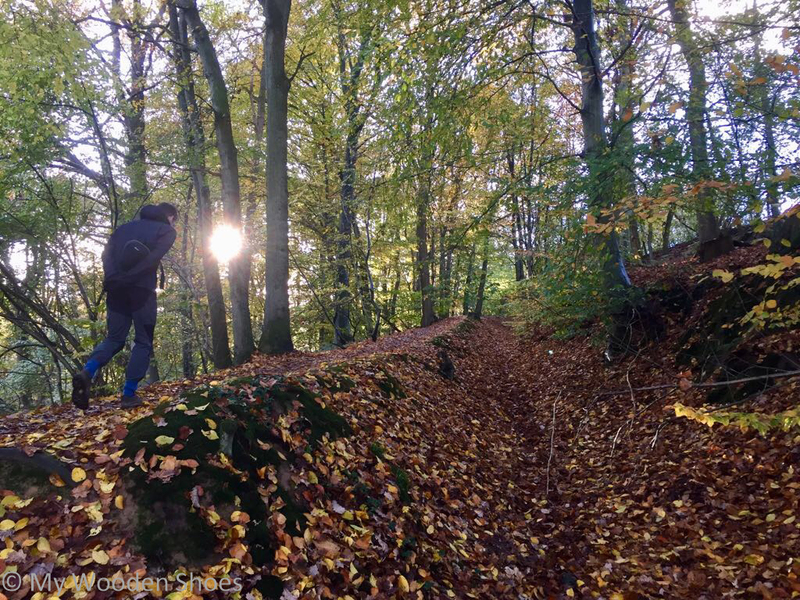 Read our blog about mountain hiking in Holland to find more awesome trails. The winter season started with an astonishing amount of snow. 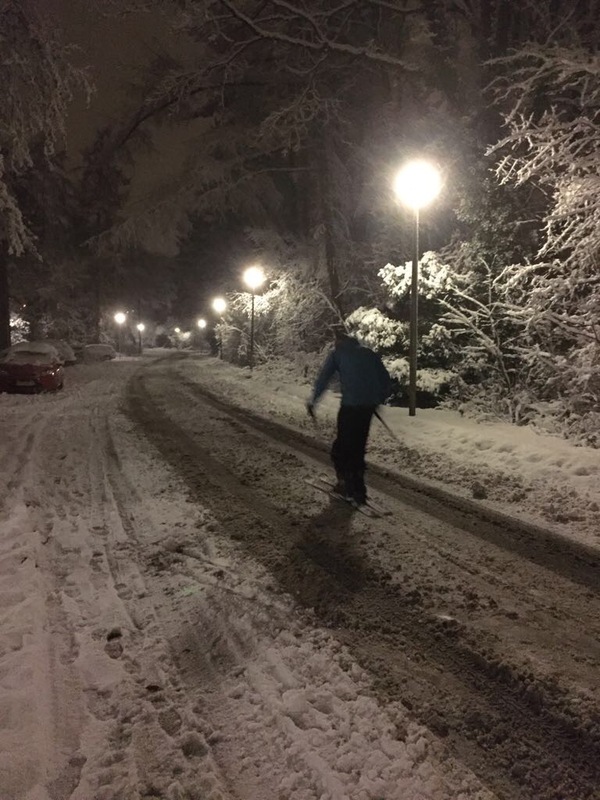 Ever since we made the “mountain of Amersfoort” our home in 2016, it had been Arnoud’s wish to try to ski down the street in front of our house. The “mountain” of Amersfoort is a remarkable 45m high and our street has a 5% incline at its steepest point. This activity could definitely be seen as going off-piste but it wasn’t exactly an adventurous ride. 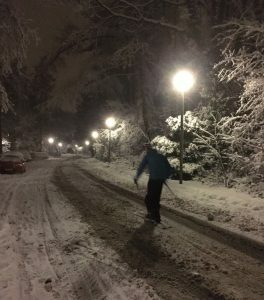 We did promise each other, though, to soon purchase a pair of cross country skis for some trekking in the surroundings after the next snowfall. We are looking forward to more trips in the new year. Happy 2018!